Before I began my last post on the life and work of Roy Underhill, I tried to write an essay about Robert Frost and Aldo Leopold. The single stanza of Frost’s poem, “Two Tramps in Mudtime,” that Shirley Showalter included in a recent post sent me down this path, but connecting these contemporaries through the idea of vocation has been much harder than I expected. In any case, I am convinced that both writers understood something about work, and the direction it was headed during their lifetimes, that sheds important light on the modern world and what we are called to do in it. To avoid the second, he should lay a split of good oak on the andirons, preferably where there is no furnace, and let it warm his shins while a February blizzard tosses the trees outside. If one has cut, split, hauled, and piled his own good oak, and let his mind work the while, he will remember much about where the heat comes from, and with a wealth of detail denied to those who spend the weekend in town astride a radiator. Questions about where the heat comes from down here in Florida are lost on me… especially in July. At the same time, though, I have studied enough thermodynamics to understand how a refrigeration cycle works, and it doesn’t take much critical thinking to conclude that the spiritual danger Leopold describes looms large over almost everything we do when it comes to work and energy. There is, in fact, a great big fire burning somewhere that keeps my air conditioner running all summer long (thank you, Willis Carrier!). But what are we to make of this spiritual danger? Is it really a danger? Is it really spiritual? 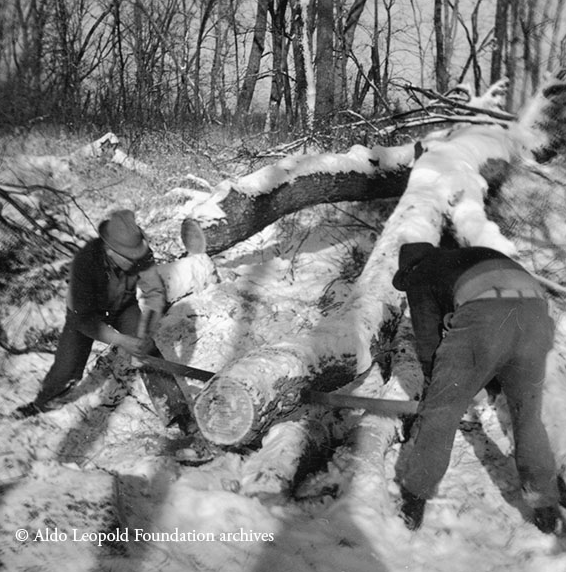 At a minimum, Leopold is suggesting that once the connections between people and the natural energy sources that sustain them are broken, there is cause for alarm. Whether keeping a garden or splitting some firewood on the weekends (two things I do not do) represents any sort of movement towards salvation is another good question, but how (and whether?) to engage this issue through the lens of vocational discernment seems more critical. We can here see a theme that recurs in Frost’s works: the encounter between two kinds of worker, the scholar and the labourer, an encounter that all too often is a clash. One of the ideas I address in my essay in Vocation Across the Academy is that vocation represents our search for transcendence in the context of our working lives. Transcendence, in this particular sense, always requires an object, or specific divergence, if the idea is going to have any practical implications. The two divergences that clearly troubled Leopold and Frost — our disconnect with nature and our disconnect with each other — are probably more pressing and significant today than they were 100 years ago. Which brings me back to Roy Underhill. The message here, of course, is not to encourage everyone to trade their laptops for hand planes and broad axes. I only chose him as a modern example of someone who undoubtedly heard a call related to some very critical issues and then set about trying to build a capacity for transcendence. What I really appreciate about Underhill is that he also decided that it is important to share this capacity with others. The skeptic in me does not expect that we will run out of divergent problems anytime soon… and I also have my doubts that Robert Frost, Aldo Leopold, or Roy Underhill will resonate on these specific issues with many undergraduates. Nonetheless, careful examination of the problems these three authors have wrestled with seems critical to both vocational exploration specifically as well as higher education more generally. The good news is that opportunities for transcendence abound, and finding creative and integrative ways to introduce and explore the work of Frost, Leopold, and Underhill should help to point us in the right direction.